It wasn’t until a few years ago (maybe two) that I developed a real taste for fish. I mean really enjoying eating fish. And actually being able to choose to eat fish and not being forced to eat it because that is all that was offered for dinner that night. Granted that was usually really fresh fish that my dad caught in the lake that day, but I would have rather had a bowl of plain pasta. You see, I grew up going camping. Camping on lakes. Boating on lakes. And along with boating, came fishing. I loved to go fishing when I was younger. Now I’d rather read a gossip magazine, but that’s besides the point. So while I had gotten away without eating fish for a while, my like in eating it has returned. And I at least think it is a little bit healthy for me too. 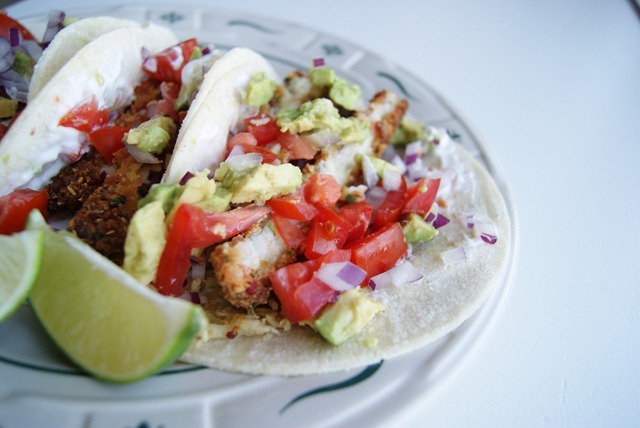 So many restaurants offer fish tacos on their menus now and I think that is what got me hungry for creating my own. 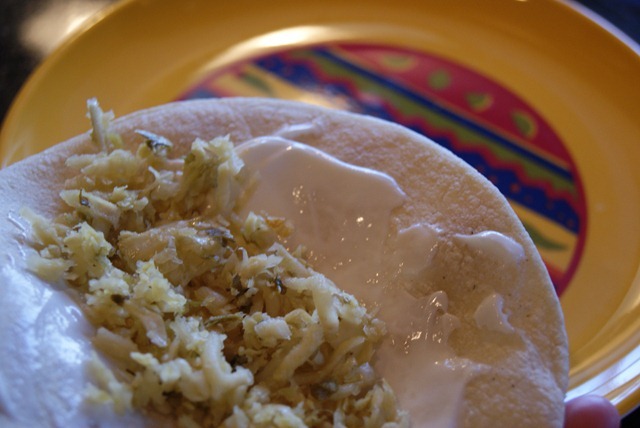 That and my mom and I got this great salsa verde slaw at a local farmer’s market that we thought would be delicious on fish tacos. It did not disappoint. 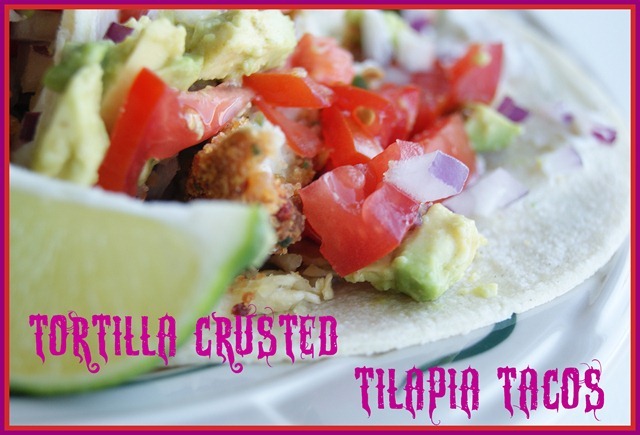 Sour cream, tortilla crusted tilapia, avocado, lime juice, tomatoes, corn tortillas, salsa verde slaw and red onions. 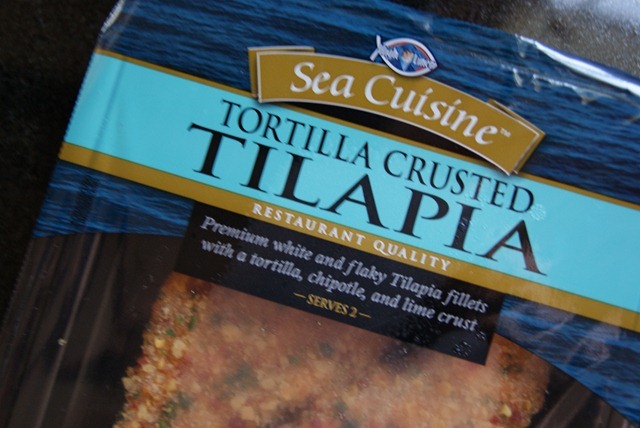 It may sound silly, but when I spotted this tortilla crusted tilapia in the store I about jumped for joy. I knew it would be the perfect fish for my taco creation. And I was right. I baked the fish until it was super crispy. Fish in tacos? Not too long ago I wouldn’t even have thought that sounded good. But now, I love them! And these are the best fish tacos I have ever had. 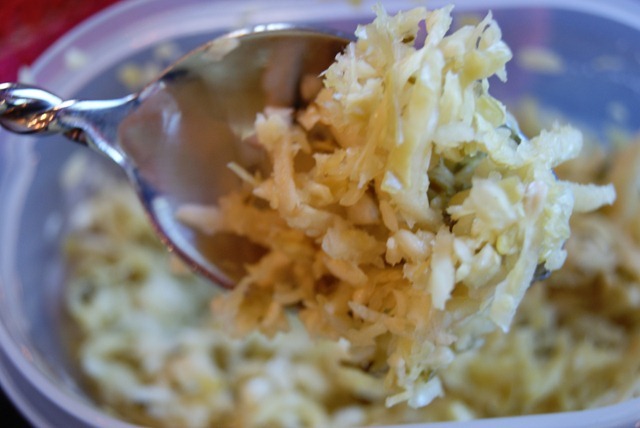 This is the salsa verde slaw that was purchased at a local farmer’s market. Cook fish as directed. 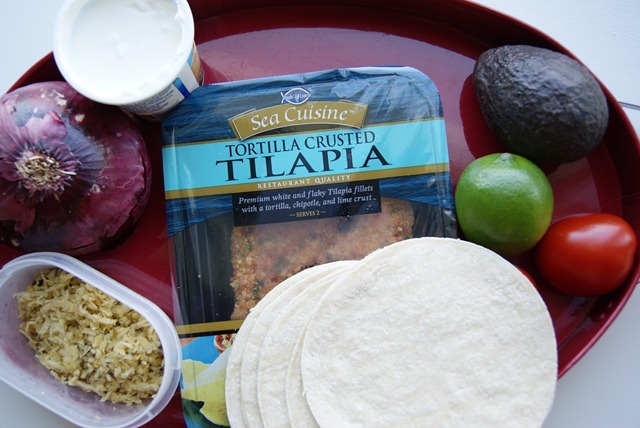 Slather sour cream on to a tortilla. 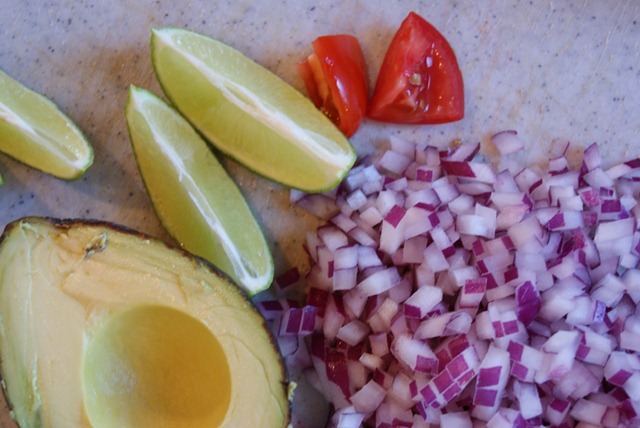 Top with sliced and diced avocado, tomatoes, red onions, squirts of lime juice, sticks of baked fish and spoonfuls of salsa verde slaw. 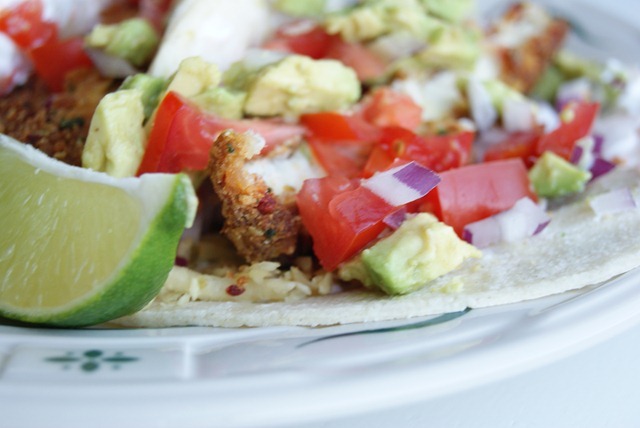 Wrap your mouth around the taco and taste the deliciousness! 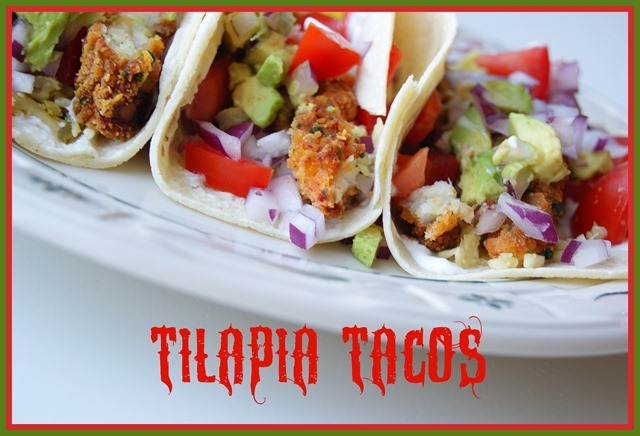 I find that corn tortilla’s make these tacos much better, rather than using flour tortilla’s. A very enjoyable casual meal. Colorful too. 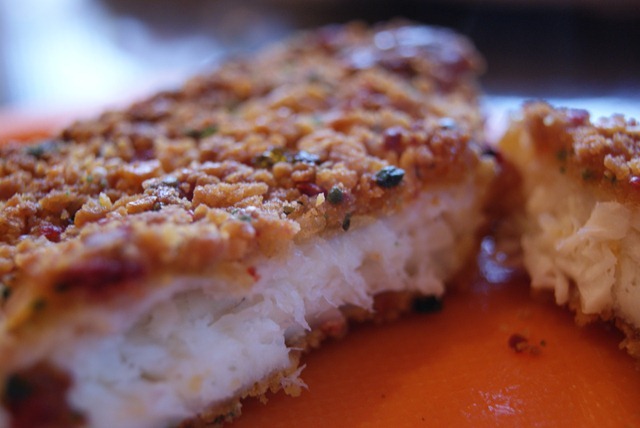 I love the crispy fish that was seasoned great with the tortilla crust on it. Now go grab a frosty libation and enjoy your summer 2011! A great way to introduce fish to someone who isn’t used to eating it. Have you ever had a real fish fry? I mean fish that is straight in from the lake where they were caught? Do you like to go fishing or do you find it boring sitting there waiting for the bobber to move? 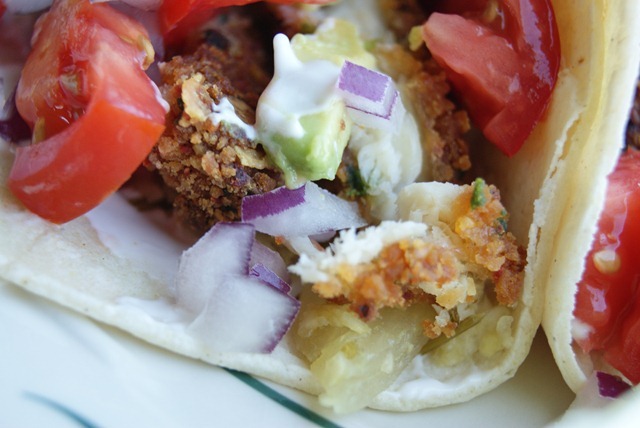 This entry was posted in Deliciousness and tagged fish tacos, savory bites. Bookmark the permalink. These look amazingly delicious! 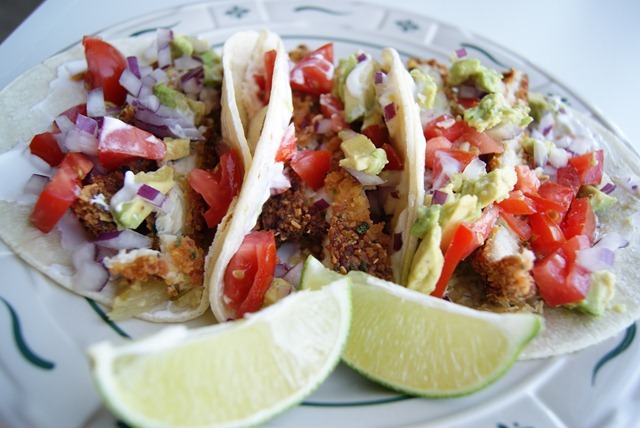 The only fish tacos that I’ve had were with grilled fish and they were really good. Yours looks way better though. 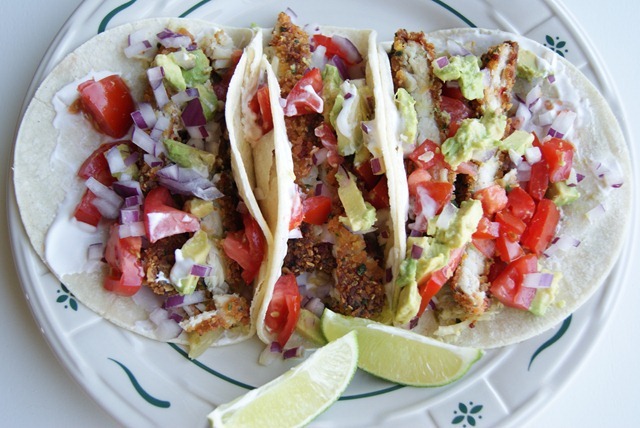 I’m going to look for some of the tortilla crusted fish and give these a try. Yum! I grew up in FL for the better part of my life so I’ve always had a taste for seafood. But when I moved out to AZ, it was the first time I heard of fish tacos and not gonna lie, the sound of it kind skeeved me out. Then I tried them–omg!! I’ve made them a few times but never crusted them before, just made on the stovetop but I love the idea of coating in tortillas! Love the tacos, they look scrumptious! I only starting liking, actually LIKING, fish a few years ago too. 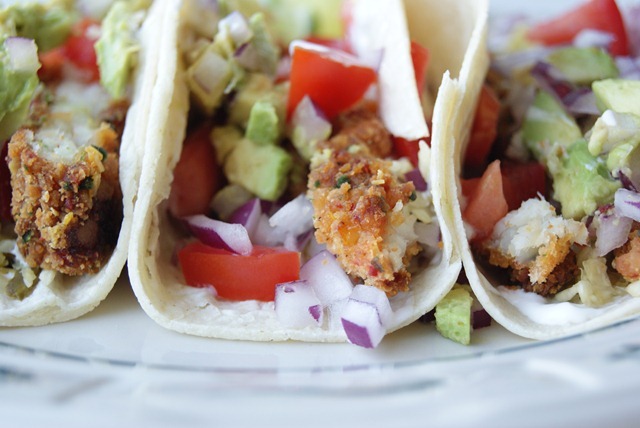 Your fish tacos look outstanding! Those look so yummy!!!! I wish I was eating them right now. It’s funny, but my favorite fish tacos come from Cheddars Restaurant. They have cole slaw in them.